“We had to wait another three and a half years for the first England v Australia match in England. However, the Australians did come over to Britain in 1878 on what is regarded as the first proper representative tour here.” The last game of this tour was against a Sunderland side, one of ten Sunderland -based games eventually scheduled to involve Australia. Keith, who looks after the extensive archives at the city’s Ashbrooke Sports’ Club, decided to put together a book of records and photographs to celebrate the first Durham Test. “Eight of Australia’s ‘Sunderland games’ were scheduled to be played at Ashbrooke – the first in 1912 and the last in 1977. 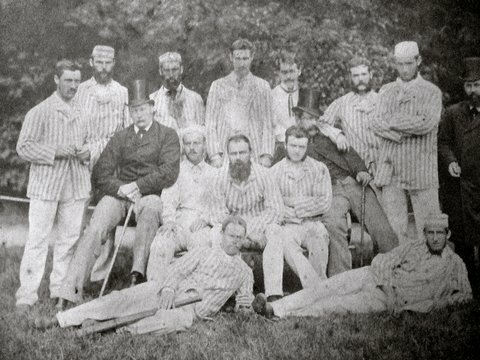 The archives contain many rare photographs of these games but the one that stands out pre-dates Ashbrooke itself and Ashbrooke has been on the go since 1887.” Prior to Ashbrooke, the Australians took on Sunderland sides twice, in 1878 and in 1880, just before the first Ashes Test in England. A photograph of the 1878 side is in club archives. “The photograph shows the entire 1878 Australian squad of 12 plus three officials and has bushes in the background. I searched internet photograph sites for a similar picture and came up with a blank. I sent a copy to one of Australia’s leading cricket historians who researched it and noted that ‘it did not ring any bells’. More recently a researcher at the MCC at Lord’s confirmed that they had no copy. It is an exciting discovery. ” The story of ‘Australia in Sunderland’ is an exciting one too, packed with interesting information and flagging up cricketing characters, some well-known and others little known. Australia in Sunderland: The Making of a Test Match is available from all good bookstores including in the USA Barnes and Noble and Amazon, in the UK Amazon and Waterstones. For other countries Book Depository offer free delivery worldwide.